As a health professional in NSW, you play a crucial role in the BreastScreen program. Learn more about supporting your patients in breast screening. As a health professional in NSW, you play an instrumental role in the BreastScreen program and our overall goal of improving breast cancer survival rates. In this section, you’ll find information and resources designed to assist you in supporting your patients with various aspects of the screening mammogram process. 1 in 8 women in NSW will be diagnosed with breast cancer by the age of 85. Breast cancer is the most common cancer among NSW women, accounting for 28% of all cancer diagnoses in the state. 9 out of 10 women who develop breast cancer do not have a family history of breast cancer. Early detection of breast cancer - while the cancer is small and has not yet spread to other parts of the body - is one of the most important factors in improving survival and recovery from breast cancer. 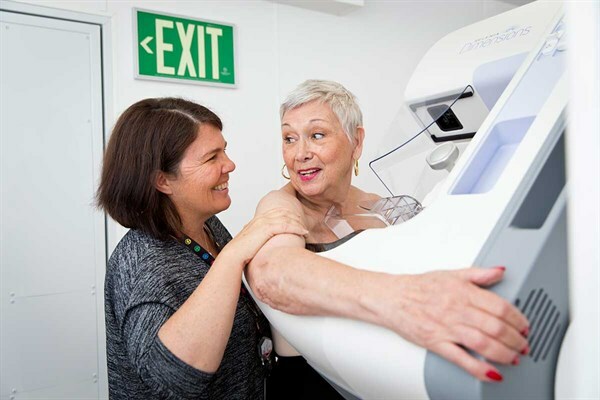 Women who have their breast cancer detected early through a screening mammogram with BreastScreen NSW are half as likely to need a mastectomy. By helping to detect breast cancer early, the BreastScreen program plays a vital role in improving chances of survival. Who is Breast Screening For? BreastScreen NSW targets women aged 50-74 to have a free screening mammogram once every two years. However, only around one in two women attend regular screening mammograms. This means there is scope to significantly increase the number of women who are screened. Our aim is to achieve a participation rate of 70% among women in the target age group, which is aligned with the national target for the BreastScreen program. With your support, we can encourage more women to have regular screening mammograms and, as a result, improve the survival rate for breast cancer. BreastScreen NSW has a range of resources for health professionals, available to download and order through our website. This education tool has been developed for use by multicultural health and community organisations, including the Bilingual Community Education (BCE) program. The purpose is to provide information on breast health, breast screening and breast cancer to women from different cultural backgrounds. Particularly those eligible to participate in the BreastScreen NSW program. This brochure provides information for women who have breast implants and answers some questions about what happens at a breast screening appointment. This brochure provides information about what to expect before, during and after your mammogram. This brochure provides information about accessibility to BreastScreen NSW for women with disability.